Modern cars may be safer and better-built than they've ever been before, but don't think that means it's completely impossible to die in a new one. A new study from Insurance Institute for Highway Safety released today dives into the American cars with the highest and lowest death rates. The IIHS study examines the driver death rate per million registered vehicles on the road over the past few years, focusing specifically on 2011 model year mainstream production cars. It says that had modern cars stayed the same as they were in 1985, there would have been 7,700 more deaths in 2012 alone than there were. The study has a lot of good news, including signs that even new cars are rapidly improving in terms of safety. 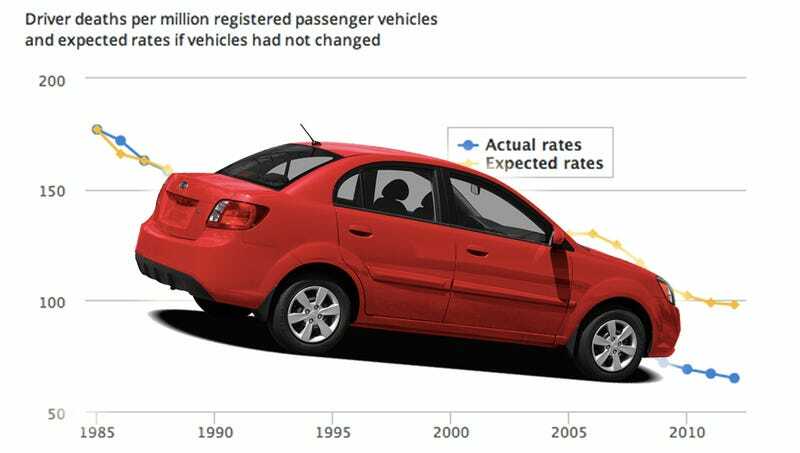 In 2008 and 2009 model year cars, there were 48 driver deaths per million registered vehicles; on 2011 model year cars, that went way down to 28 driver deaths per million. As crash test outcomes improve, so do real world results, the study says. The good news is that there are now a record nine 2011 model year vehicles with driver death rates of zero, which means no driver was killed in a crash in those vehicles during the studied time period. That's the best outcome since the study began in 1989. In 2007, there were no cars with driver death rates of zero. As NBC News points out, this information is already a bit dated, as many of those cars on the worst list (and in general) have been updated or replaced since the 2011 model year. The 2011 Prius, for example, used to fare poorly in the small offset crash test, but its latest version earns top safety marks. The complete elimination of traffic deaths? I don't know if it will ever happen, but it's the goal automakers, the government and the insurance industry all have in mind. If you're wondering why driverless cars are going to be a thing soon, remember that there's more to that than just convenience.